Here's another iPhone 5 release date rumor to add to the pile. 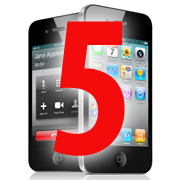 An AT&T vice president has reportedly informed employees that the iPhone 5 will launch in early October, an unnamed source tells Boy Genius Report. Other Websites, including All Things Digital, have also reported rumors of an October launch. The blog 9 to 5 Mac has pegged the launch date for October 7, with an announcement in late September. Granted, the rumor mill had also reported a September iPhone 5 launch in the past, and Boy Genius Report had even suggested that the iPhone 5 would launch in August. Neither outcome seems likely now, so let's not forget that some Apple rumors turn out to be wrong. But whether the October iPhone launch pans out or not, there's at least a kernel of truth to the other half of BGR's rumor. Apparently, the aforementioned--and unnamed--AT&T vice president also issued a warning to employees: "Expect things to get really, really busy in the next 35-50 days, so prepare your teams accordingly." That's what I've been saying, and not just because of the iPhone. Google is now rumored to launch its "Nexus Prime" smartphone in October. Samsung will soon bring its Galaxy S II smartphones to the United States. Microsoft's Windows Phones are getting a second wind thanks to the upcoming "Mango" update. Even Research in Motion is getting in the mix with some new Blackberry handsets. All of this follows a rather sleepy summer in high-end smartphones for AT&T. There was no new iPhone, as in previous years. The only new high-end Android handset was Samsung's Infuse. There were no new Windows Phones. If you're bound to the carrier--say, with a family plan--you've got every reason to wait for the rush of new hardware. Much of it is landing in the early fall--including, most likely, the iPhone 5.